There’s nothing I like better than finding the right piece of software with my business. The right piece of software can free your time from the mundane, so you can focus your energy on BIG things! It can take a lot trial and error to find the right fit, and for email followup on Amazon, I think we’ve finally got a winner. In August, you may remember my post about switching from Feedback Genius (FBG) to Salesbacker (SB) (Read about it here if you’re a member of the Startup Bros Ecommerce Empire). Well I’m posting now to say that I’m switching BACK to Feedback Genius. In October I spoke at the Import Empire Summit in Orlando and met one of the other speakers and Co-Founder of FBG, Jeff Cohen. Since I had switched to Salesbacker in August, the Seller Labs team made some updates to the interface and tools that I found particularly intriguing. But one thing that I didn’t realize about FBG or SB is how they trigger delivery event emails. 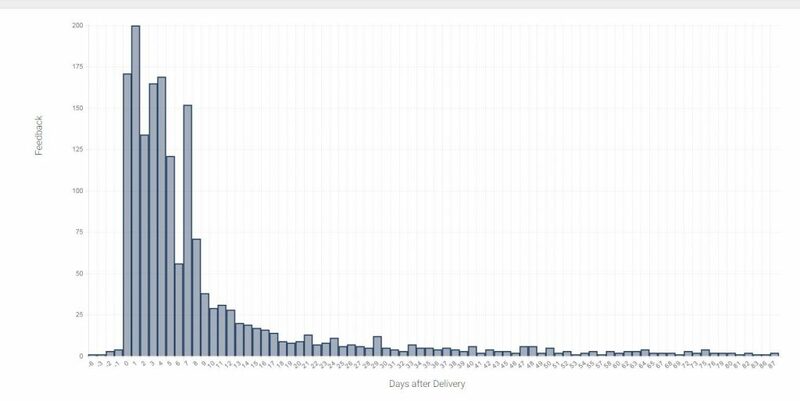 It’s all very technical, but SB triggers delivery emails based on Amazon’s estimate, while FBG triggers it based on when it is actually delivered by the carrier. This may seem like a small thing, but once we switched to SB, we started getting 10 emails a week saying, “Hey where’s my package!? You said it was delivered!” Some of the emails started getting angry. Those 10 emails a week were costing us time, which costs us money and it was only going to get worse with the higher sales volume as we grow. 1. From March to August I had a 2 email sequence. The first at delivery asking if they got their order and if they had any questions. This is where I would ask for a seller feedback, which is the percentage reported right now by FBG. The second email happened at day 7 after delivery. As far as I know there’s no way to track Product Feedback % in FBG. 2. You’ll notice that from Aug to Sept my feedback rate dropped form 9% to 4.5%. This is when I switched to Salesbacker BUT I also switched to the 3 email followup sequence suggested by the guys at ZonOptimize, shoutout Anthony Lee! The goal of the Review Rush service isn’t technically to get seller reviews, so I’m not sure we can blame SB or ZO for that. 2. You’ll notice in the second picture that most feedback was obtained on the day of delivery or the next 2 days after. But you also see a spike at the 7 day mark, which tells me people are remembering to go back to leave seller feedback even though I’m only sending them a link for product feedback. Get My SECRET Email Followup Sequence Templates for FREE! STEP 1: Sign up for FBG using Dr. Ben’s FBG Affiliate Link. STEP 2: Email your order receipt to FBGbonus@ecomdocs.com. STEP 3: Wait for us to send you my awesome templates. Campaign Organization is somewhat complicated. You use delivery emails to get the customer’s attention right then. You need tight control of a complex followup sequence. You want multiple Seller Central accounts integrated into one system including UK. You use simple campaigns with no delivery email. You need to save a few bucks a month.